Hello & welcome! This is Macon York Costlow, co-owner and creative director of Macon York Letterpress & Design. As of this year, my business is re-launching as Cotton Blossom Press. We are a design and letterpress studio in Asheville, North Carolina specializing in elegant custom work, including wedding suites, personal stationery, announcements, business cards, and more. We also create printed goods that honor life in Appalachia and all that we hold to be beautiful and true. In 2010, I attended a letterpress workshop at The Arm in Brooklyn. Immediately, I fell in love with the meditative process of letterpress: the focus required to carefully set up each project, the gliding repetitiveness of printing, and the magical textural effect it creates. As someone who is very confident and optimistic, I boldly started a business. In the beginning, my enthusiasm and passion drove the business and made up for my lack of business skills and structure. The business grew slowly with some triumphs but also with many mistakes. Because I never really had a plan in place, I frequently felt overwhelmed and unsure of how to move forward. Despite this, I knew that I did not want to give up. I love every aspect of working with clients to create beautiful wedding invitations and stationery: providing a clear outline of the process, truly collaborating with my clients by listening to their design and aesthetic preferences even when they are not able to articulate this themselves, creating original designs, and then of course bringing them to life through the letterpress process. Simply put, the creative part of the business was going splendidly; the business part of the business was not. In the late winter of 2015, Luke (my now husband) and I took a business planning course through Bird's Eye in Asheville. We started building a real plan and structure for the business, including becoming an LLC. This provided a wonderful opportunity to reflect on our mission and goals. Around the same time, however, we also planned a wedding, got married, honeymooned, moved in together, and began our marriage. Needless to say, the business planning took a bit of a backseat. Still determined to succeed, I signed up for one-on-one business coaching last Autumn with Jodi Rhoden, who has truly been an inspiration. Combining the wisdom I have gained since starting my business in 2010 with my dreams and goals for the future, I have finally written an official business plan and made some organizational changes on how I operate my business. I am proud that my craft has been able to support my lifestyle for the past several years, even with all the mistakes and learning curves. As I look to the future of my business (and my personal life), I am excited for this new chapter with Cotton Blossom Press and all that it represents: more organization and structure, a business plan in place, new designs and creative experiments, and continued success. I love my maiden name, Macon York, and initially figured that would be the name of my business. At first the tag line was "Letterpress Stationery" which later became "Letterpress & Design." The tagline eventually morphed into the business name, "Macon York Letterpress & Design." I started to feel confused about sharing my personal name with my business - where was the line separating Macon York the person/artist from Macon York the business/brand? Macon York the person is also a hiker and gardener, but that was not part of the Macon York brand - or was it? In addition, I love social media and blogging. I have always connected to new clients from these platforms and stay connected to friends and acquaintances with whom I would otherwise lose touch. As my business grew, social media and blogging started to feel confusing. Before I had a business, I blogged on a site called Velvet Nectar. I started reading marketing articles for small business owners and began to feel like I was supposed to blog as a wedding invitation expert, though part of me just wanted to share photos of my garden. Conflicted, I slowly stopped blogging altogether. The same confusion carried over to Instagram and Facebook. After much brainstorming and reflection on the brand I wanted for the business, I created the new name: Cotton Blossom Press. COTTON is a natural material that is soft, elegant, durable, natural, and accessible. I like that it has a nod to my Southern heritage. Our house-stock paper is Crane Lettra which is 100% cotton. I have found that cotton paper enhances the look and feel of letterpress. BLOSSOM adds some charm and a touch of femininity. Blossoms are fleeting, which seems appropriate for what we do - invitations and greeting cards are beautiful and make you smile, but rarely do you keep them forever. They add wonder to the present moment and then are gone. PRESS describes the business, as we specialize in letterpress. That being said, I like that the word “press” is open-ended and allows for growth, should we expand to offer items beyond paper products. The brand new website www.cottonblossompress.com represents our letterpress and design business. This website provides clear information about what the business offers and the process of working together. It will remain a professional, business website. I plan to keep www.maconyork.com as a personal website with my own artwork portfolio, as well a place for my other interests including hiking, gardening, natural living, and herbal medicine. Any personal and experimental work I do that is not part of the Cotton Blossom Press brand will be featured on this site. Cotton Blossom Press is on Instagram as @cottonblossompress and will be posting letterpress and wedding work. Follow @maconyork for a peek into Macon’s personal life: gardening, hiking, herbal medicine, goofy friends/family and more! The Macon York Letterpress & Design Facebook Page will soon become Cotton Blossom Press. If interested in monthly news, feel free to sign up for the Cotton Blossom Press Newsletter. Hello + Two big announcements! Hello! Welcome to the BLOG section of my website. It has been a long time coming and I'm excited to finally publish my first post! Back in 2009, I worked for New York Magazine as the Art Assistant. My job was to help with administrative duties in the Art Department (sending contracts to illustrators, keeping the wall updated, etc) in addition to a few design projects. Ever ambitious, I was incredibly curious and eager to do more creative work. I had just discovered the endless amount of visual inspiration that could be found the internet, via blogs (before Pinterest). So just like that, I started my own blog, "Velvet Nectar." I described it as "news, musings, and photographs regarding letterpress, design, and attempt at authentic living." It was filled with thoughts and photos of my life in Brooklyn, as well as cool, creative things happening around me. When I felt creatively stifled in the office, my blog was my outlet. Eventually, I began doing letterpress and design, which fulfilled me creatively, and the blog fell to the wayside. I miss having a small writing outlet, however, so here we are again. #1: This summer I bought two Vandercook #4 Letterpress machines. I bought the first one from my friend Laurie who owns the local letterpress studio, Asheville BookWorks. The second was purchased from Dan at The Arm in Brooklyn, New York - where I first learned to print. It's arriving next week and I can't wait! More on my presses and studio in an upcoming blog post. 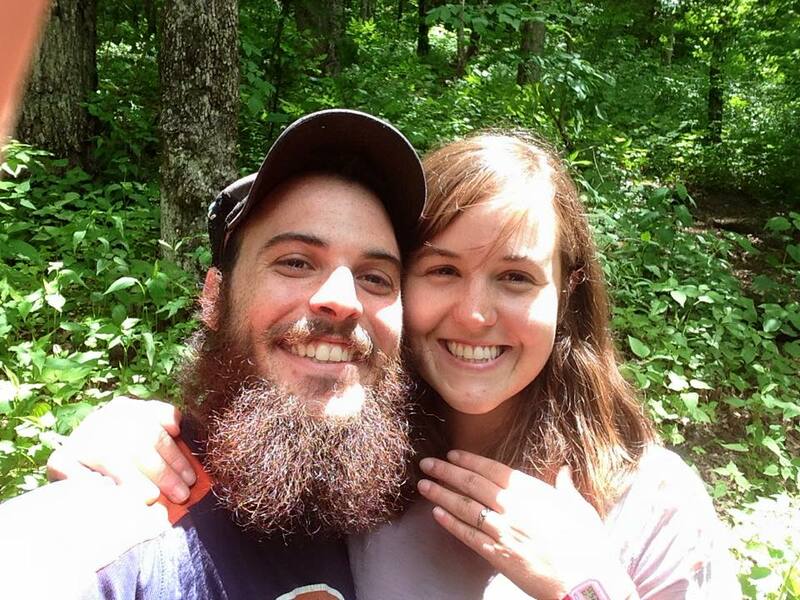 #2: I got engaged in May to a wonderful man I met in 2012 while hiking the Appalachian Trail! I am so excited to enter in to the mystery and magic of marriage. After working with so many lovely brides on their invitations, and attending 8 wedding last year (!! ), it's been really fun to be a bride myself. Luke and I met near the 100-mile mark while independently hiking the Appalachian Trail in March 2012. We had been hiking for about a week at that point. We hiked the rest of the trail together, fell in love, and moved to Asheville the next year. This past May, we returned our meeting spot and he proposed! !